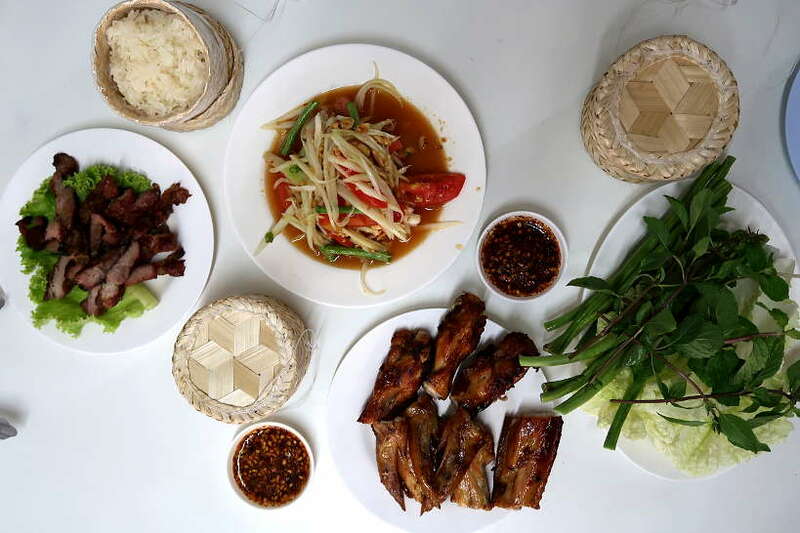 Chiang Mai, the largest city in northern Thailand, has wonderful options for Thai food lovers. The Chiang Mai restaurant scene offers a wide variety of places to eat, from northern Thai food to western food. And, according to our vegetarian friends, it is also one of the best cities inThailand for vegetarian-friendly restaurants. Our quest for the local food specialties has us focusing on the Chiang Mai Thai restaurant scene. This is the perfect place to sample unique Chiang Mai food, from Lanna or northern Thai food to Burmese influenced dishes. Amongst the many Chiang Mai restaurants, we’ve put together this list of 9 of the best Thai restaurants in Chiang Mai. These restaurants are some of the best places to eat in Chiang Mai to satisfy your hunger for authentic northern Thai food. 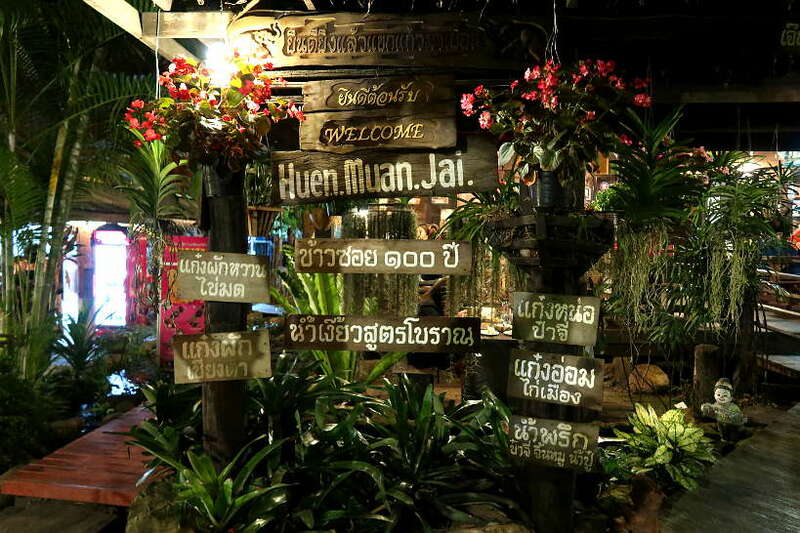 Huen Muan Jai is located in the Chang Phueak neighborhood, between the Old City and Maya Mall. It is a northern Thai restaurant set in a traditional Lanna style house. If you are new to northern Thai food, this is the best place to eat in Chiang Mai for the introduction to many dishes in one sitting. What we like about this restaurant is their extensive offering of northern Thai specialties and it’s a place where we’ve had some of the best food in Chiang Mai. In the hip and trendy Nimman neighborhood is where you’ll find the popular Tong Tem Toh restaurant. The restaurant is large and airy with dark-colored benches and even mist machines to keep you cool. As you approach the restaurant, you’ll notice two things. On the exterior is “grill master” cooking up a variety of sausages and other northern specialties. And, secondly a long line of people waiting for a table. Even though the restaurant doesn’t take reservations, it is one of the best restaurants in Chiang Mai for northern Thai food. Wait patiently amongst the many Asian tourists, as you will be delighted by the experience. 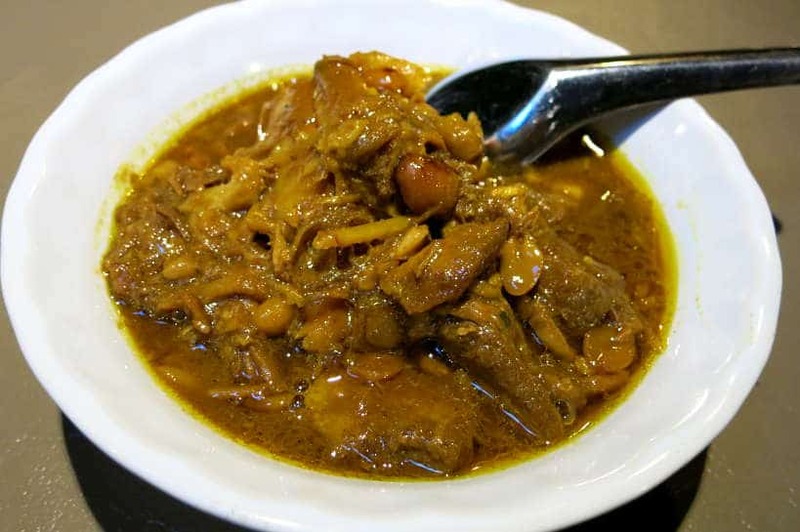 What’s great about Tong Tem Toh restaurant is their extensive offering. From their thick encyclopedic northern Thai menu are chili dips, salads, soups, stir-fries, and grilled meats. With portions on the generous side, plan to share so that you can taste more items. We started out with a few northern Thai starters like the Nam Prik Noom, or Thai green chili dip with vegetables. Plus, we savored the flavors of one of our favorite northern Thai foods, Gaeng Hang Lay. Grilled barbecue items are also very popular and we recommend not missing out on this experience. 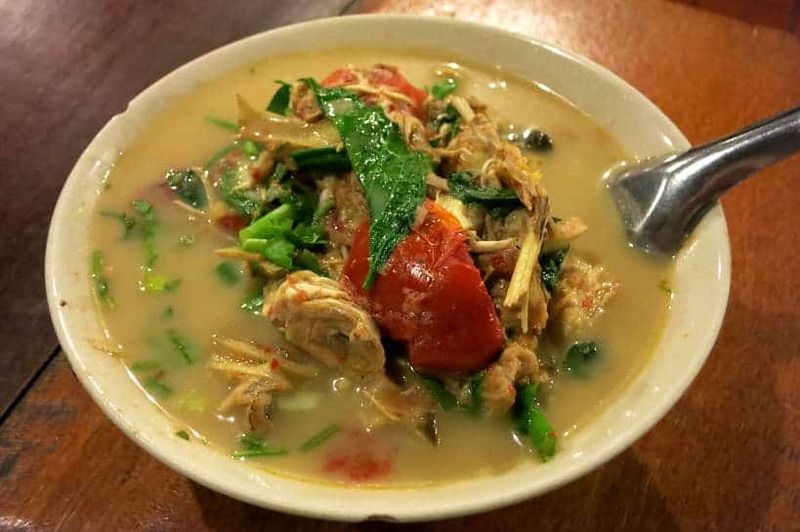 For the convenient location and flavorful northern Thai food, Tong Tem Toh is a great option. You just have to be patient with the long lines. Pro Tips: Options from the grill are only offered at dinner. Go in the evening and try freshly grilled meats, poultry or seafood. An institution in Chiang Mai, Huen Phen restaurant is known for serving Lanna style or northern Thai food for more than 40 years. Located in the Old City, you’ll find the restaurant near Wat Chedi Luang. The restaurant offers two different eating experiences. Lunch is served outdoors in a casual environment while dinner takes place in the atmospheric dining room. We like the convenient location, the quaint and antique-like setting and the focus on good quality northern Thai food. 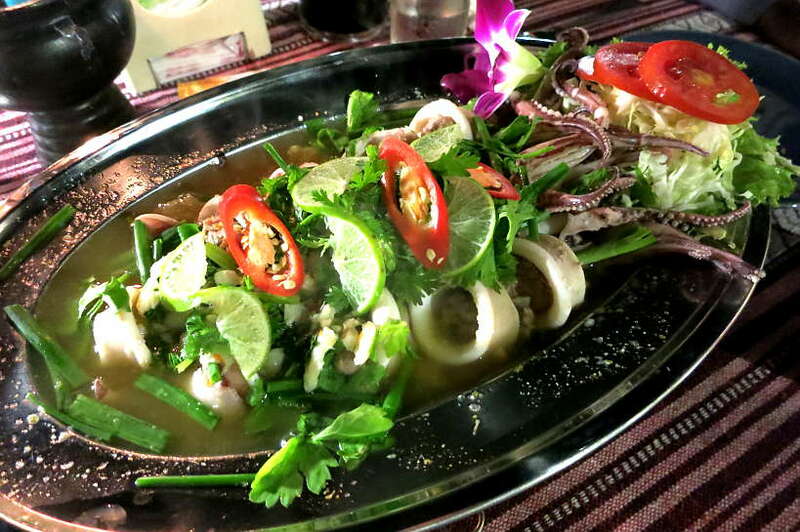 You’ll find a range of northern Thai dishes for whatever mood you are in. Some of our favorite experiences have been leisurely grazing through the chili dip starters. Having Khao Soi in the evening or trying the jackfruit curry salad. 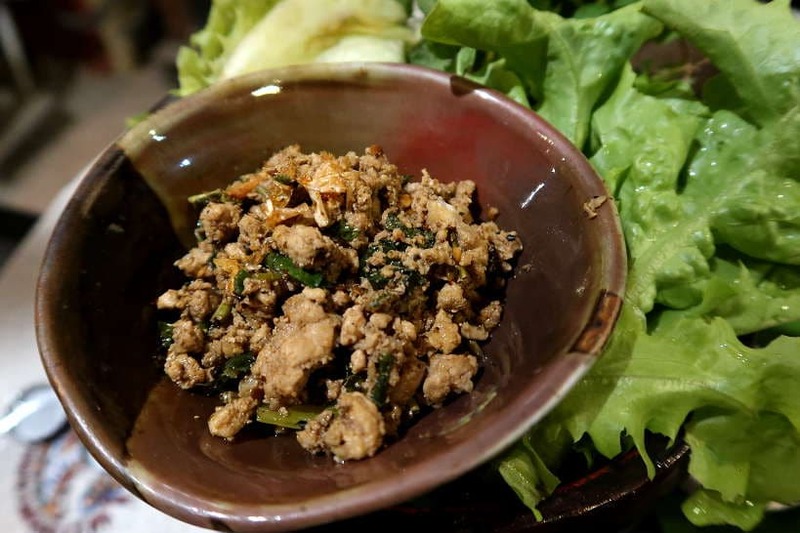 One dish that particularly stands out is the minced northern style pork salad, called larb (also spelled laarb). Very flavorful, this dish is served with a large plate of leafy greens and a side of sticky rice. Pro Tips: For a more local atmosphere, skip dinner and go there for lunch instead. If you choose to go for dinner, arrive early to avoid the large groups of tourists. One of the joys of taking food tours on your travels is discovering gems only known to locals. On a Chiang Mai northern food tour, we discovered an unassuming traditional northern Thai restaurant, we would have otherwise walked by. Located right in the South Gate area, we walked into a Lanna style restaurant, described by our tour guide as one of the best Chiang Mai Thai restaurants for northern style cuisine. The restaurant is rustic in style. At the front of the restaurant is a large open-air grill. In the back, is a surprisingly beautiful garden area where you can escape the hustle and bustle of the Old City. Popular with locals, the restaurant is famous for serving authentic northern Thai dishes for over 20 years. 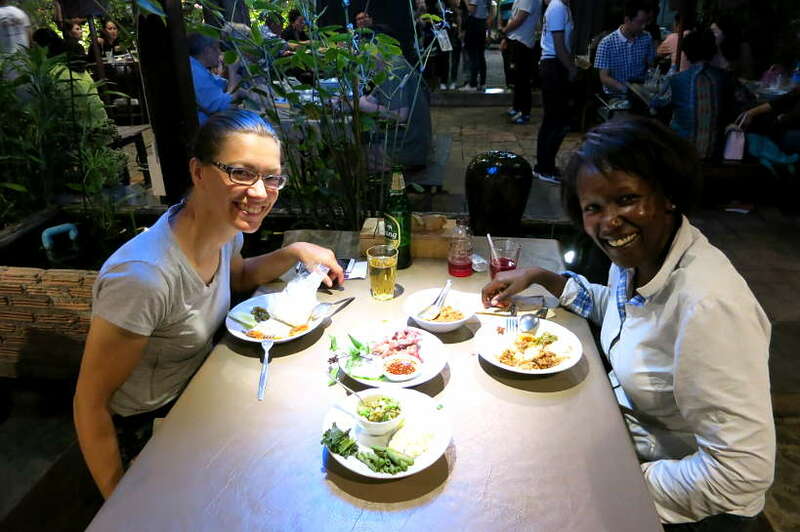 We visited the restaurant twice and each time enjoyed different northern Thai specialties. The quality of the food is exceptional and very flavorful. 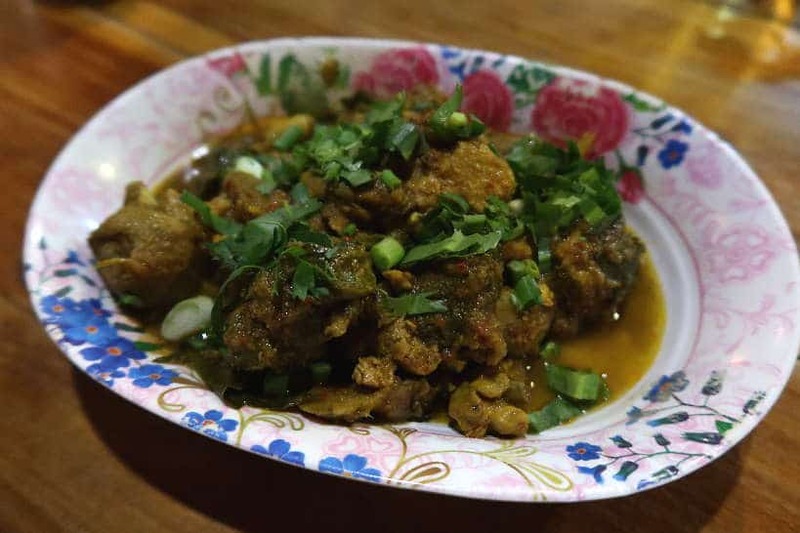 We’ve had the Larb, Gaeng Hang Lay Moo, chicken curry and even a traditional frog curry. Our recommendation would be to stick with larb (minced pork salad) and the Gaeng Hang Lay (Northern Thai pork curry). Be sure to add sticky rice, for a tasty and satisfying meal. Pro Tips: The restaurant’s name is in Thai on the sign. The best way to spot the place is to look for Baan Chern Chiangmai Hotel. It is on the right-hand side of the hotel when facing it. For a romantic riverside experience, Paak Dang offers Lanna style cuisine overlooking the Ping River. We went there for Rosemary’s birthday and enjoyed the setting with lanterns hanging from the trees, candlelit tables, and landscaped waterfalls. 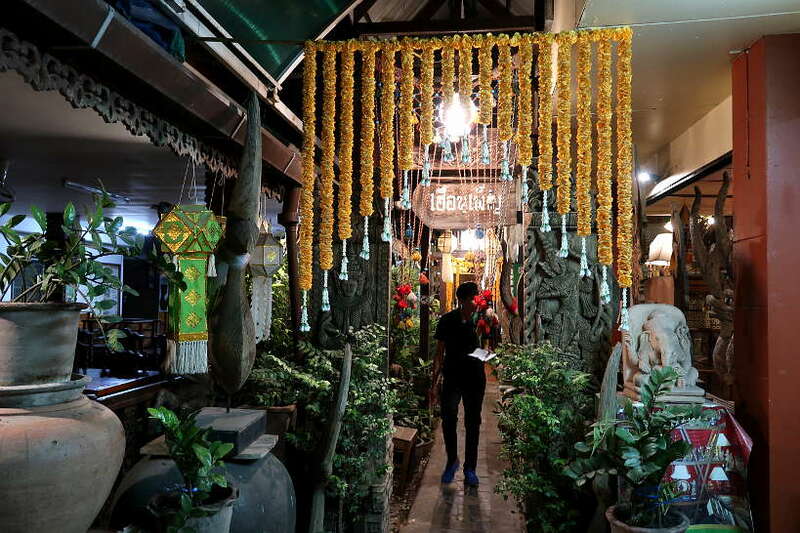 This Chiang Mai restaurant is set in a wooden Thai style Lanna house with outdoor seating on a beautiful patio. 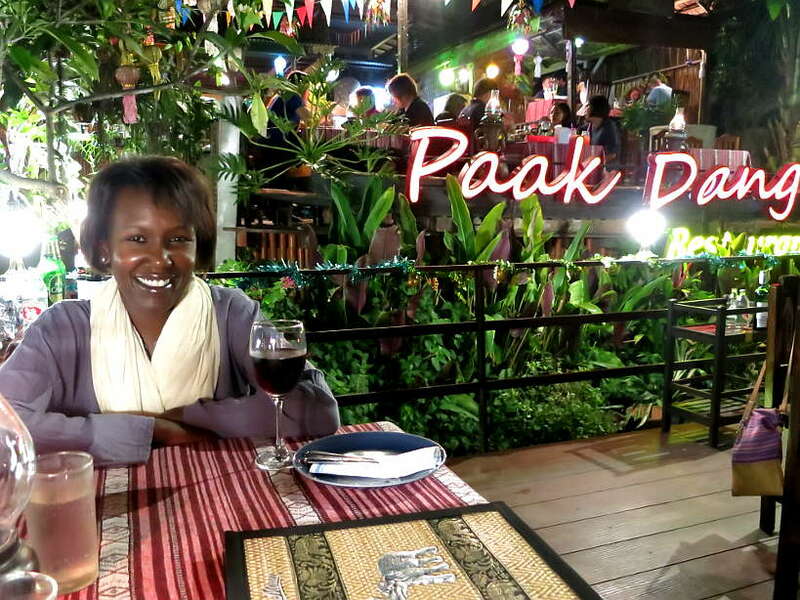 Paak Dang is also a socially conscious restaurant which gives back to the community by employing less privileged workers and equipping them with jobs and life skills. The menu offers a range of traditional Thai dishes and an emphasis on northern Thai or Lanna dishes. For the special occasion, we focused on their signature seafood dishes. They are also known for their jumbo river prawns, similar to the giant shrimp we had in Ayutthaya. We started out with Miang Kham Goong, a traditional Thai snack with grilled prawns in betel leaves. This was followed by a plate of steamed squid and finally, a mixed seafood dish served in a young coconut shell. We ended our meal with mango sticky rice for dessert, made with perfectly ripened mangoes. Pro Tips: Make reservations in advance to ensure you get a spot on the patio. Cherng Doi is a sure bet when eating in Nimman. 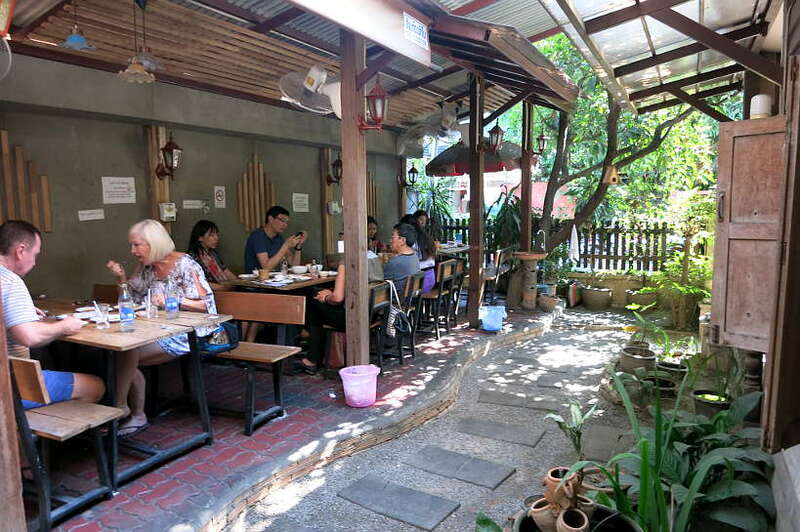 Located on Suk Kasame Road, off the busy Nimmanhaemin Road, it is an oasis right next to the trendy Nimman area. We keep coming back to Cherng Doi for their delightful chicken or Kai Yang Nong Krob served with a unique sour-sweet tamarind sauce. They also serve an interesting fried papaya salad that is worth trying. You also want to get a serving (or two) of their sticky rice, the traditional staple of Isaan or Northeastern cuisine. 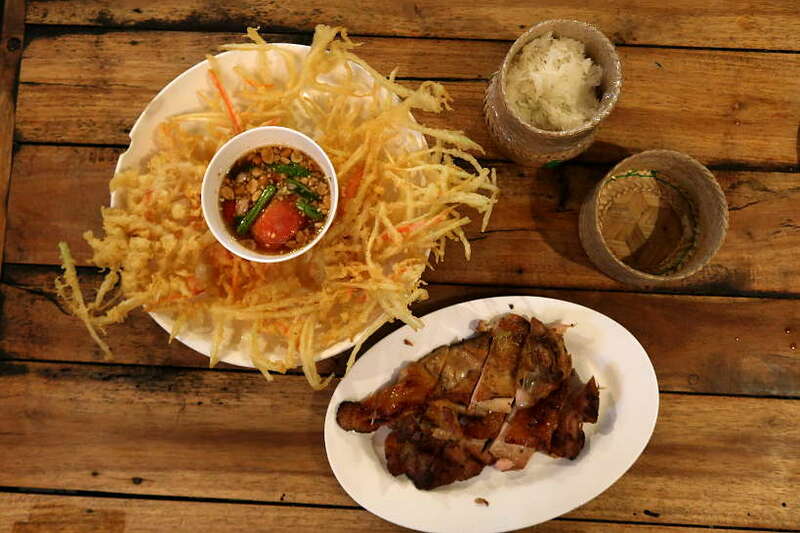 Their menu offers a nice selection of grilled meats and Som Tam or papaya salads. You can try different kinds of papaya salads from the classic with fish sauce, to one served with crabs, and even a fried papaya salad option. While the restaurant is always busy, the service is attentive and the open-air setting at the front of the restaurant is charming. It is a great place for a casual lunch or dinner. The portions sizes are medium to small, so plan to share or have several small dishes. The grilling outdoors will lure you into Toy Roszab restaurant. And the friendly face of Malli, furiously making papaya salads at the front of the stall will direct you to a table. Nominated for a global street food award, Toy, is a local gem and one best-grilled barbecue restaurants in Chiang Mai. The restaurant is set back behind the stall with tables with small tables and benches. The experience is local and you’ll find few tourists at this authentic Thai restaurant. As the specialty is barbecued meats, go for the chicken or pork. Be sure to add papaya salad and a side of sticky rice. 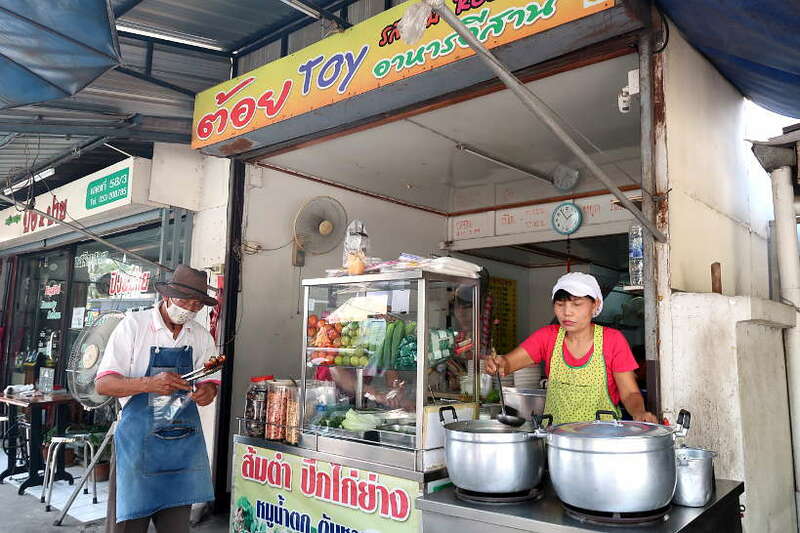 Located east of Wat Loi Kroh, Toy is an ideal stop for lunch while sightseeing in and around the Old City. The food at Toy is Northeastern Thai food, known as Isaan food. Food from this region is dominated by simple marinated grilled or fried meats. Brightly flavored salads and always accompanied by sticky rice. In addition to wonderfully flavored grilled chicken and spicy green papaya salad, we enjoyed a grilled pork salad or Moo Nam Tok, in Thai. The flavors were exceptional and the pork incredibly tender. When eaten together with a side of sticky rice, it makes for a tasty lunch stop. Khao Soy Mae Sai is located near Huen Muan Jai in between Maya Mall and the Old City. This Chiang Mai restaurant is only open for lunch and draw a number of tourists. This restaurant is famous and highly recommended for their Khao Soi, the famous Chiang Mai noodles dish. 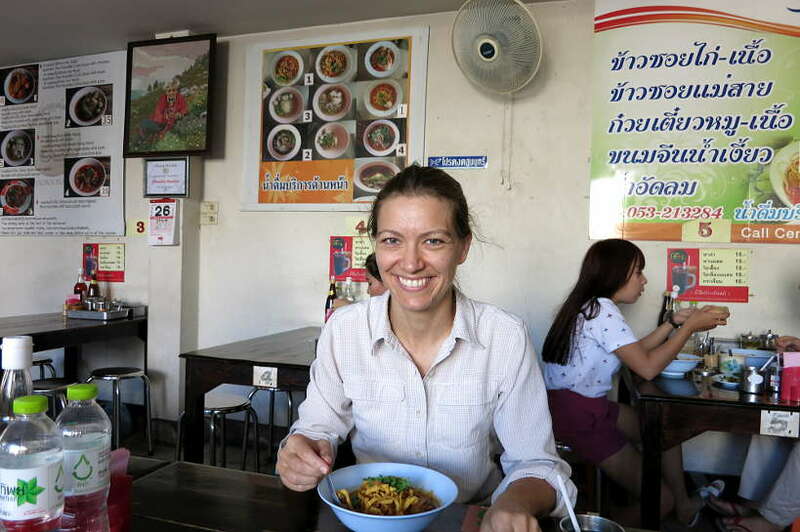 Although they are part of our 10 best places for Khao Soi in Chiang Mai, we like them best for their Kanom Jean Nam Ngiao. 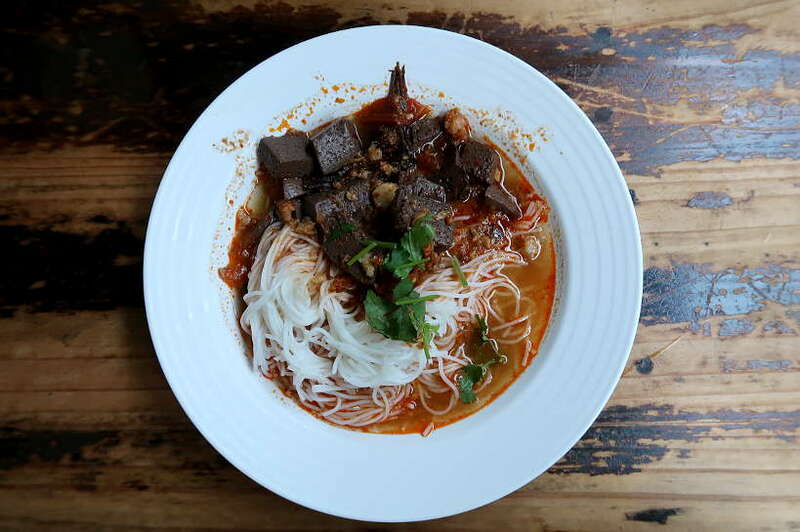 This noodle pork soup is slightly spicy with a light tomato broth served with the typical blood cubes. We suggest giving this local specialty a try, as it tastes much better than it sounds. This local eatery focuses on a few soups typical from northern Thailand and we particularly liked the flavors of this noodle and pork soup. 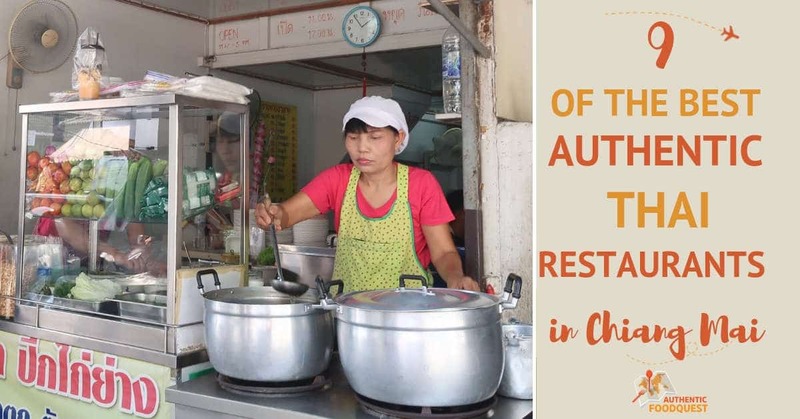 The service is fast as they have all the ingredients and bowls of noodles already prepared for their customers. The setting is casual and it is a great place for lunch when it is not too busy either off-season or outside the rush hours. Pro Tips: Due to its popularity, it can get overcrowded with tourists which tends to ruin the experience. Go outside the peak lunch hours for a leisurely experience. Popular with both locals and expats, Nong Bee’s Burmese Restaurant & Library is commonly called the “The Burmese”. 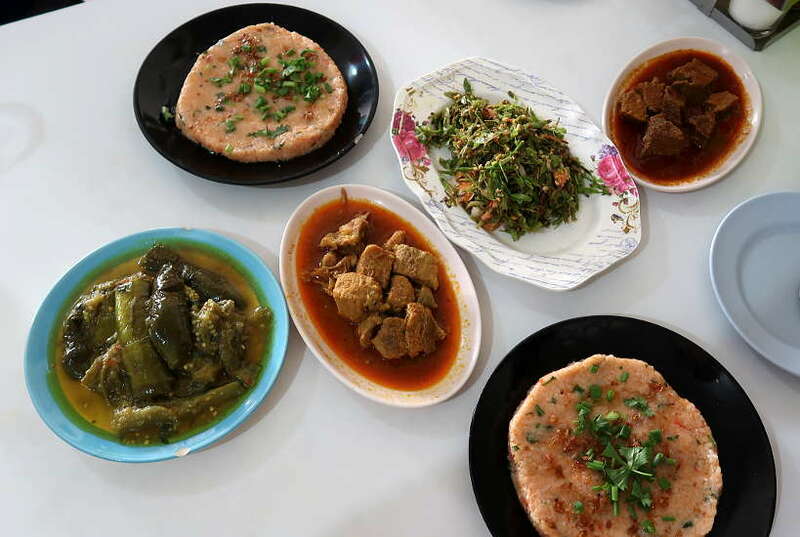 It is well-known for its budget-friendly and Burmese favorites. 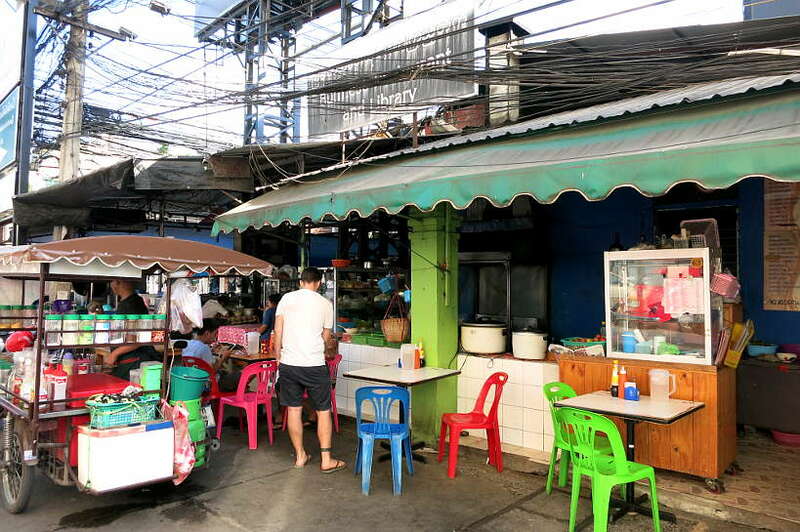 This Chiang Mai restaurant is located in the Nimman neighborhood and is somewhat of an institution. Very simple with aged decor, this is not a fancy restaurant, but a reliable place to get Burmese dishes in a relaxed vibe. Food from Myanmar (Burma) comes to Chiang Mai with immigrants from the Shan and Karen states, who fled political and social repression. Though you will also find Thai dishes on the menu, we recommend exploring Burmese specialties like the popular fermented tea leaf salad or Lahpet thoke. On the menu are about 30 Burmese inspired dishes. If you are hesitant about what to order, the friendly staff will gladly help. The portions are on the smaller side and ordering several dishes is recommended. Some of our favorites are stewed pork, eggplant curry, prawn curry, tamarind salad, shan rice, and the fermented tea leaf salad. Whatever you choose, you will not be disappointed with the unique range of flavors found in Burmese food. Pro Tips: Order several dishes and sample a variety of Burmese dishes. Prices are not marked on the menu so don’t hesitate to ask the waiter. 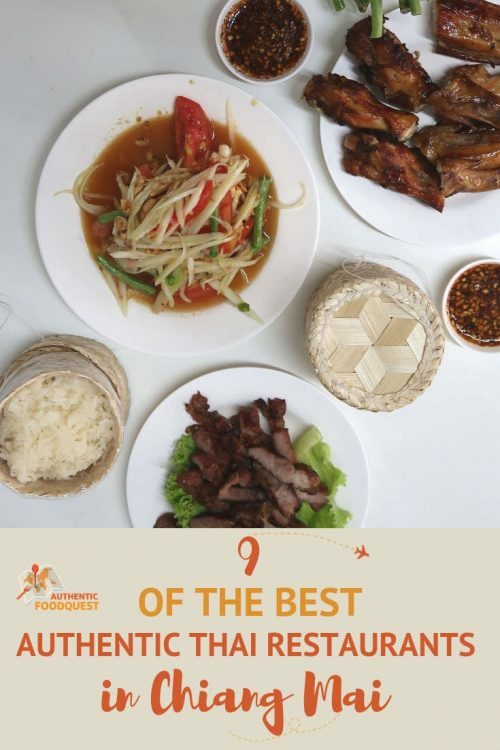 On your travels to northern Thailand, choose any Chiang Mai restaurant from this list for where to eat in Chiang Mai for Northern Thai food. These 9 of the best restaurants in Chiang Mai will offer a real and authentic taste of northern Thai cuisine. Some of them focus on a few dishes, while others offer a large selection of northern Thai foods, an ideal way to sample several Thai dishes. 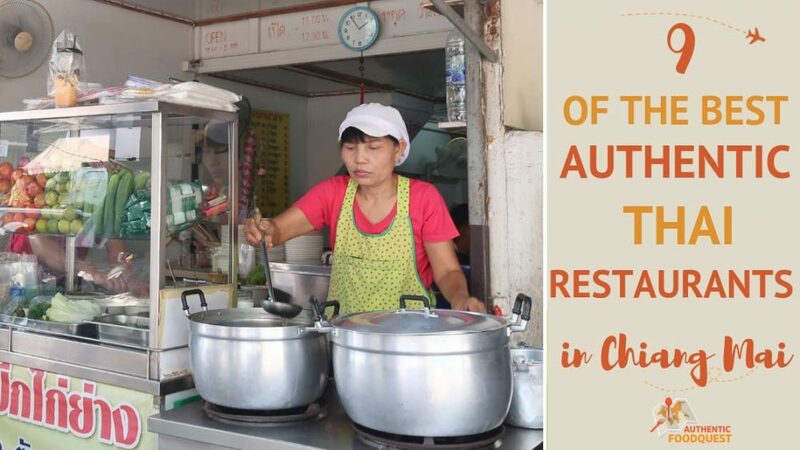 If you’re inclined, try all these Chiang Mai restaurants, alternating between northern Thai, Isaan or northeastern Thai and Burmese style restaurants. Which one is your favorite Chiang Mai restaurant? Or which Chiang Mai Thai restaurant would you like to try? Let us know in the comments below. Thanks so much Matt. Truly appreciate it!! I’ve actually never had thai food before. I really should try it one day. I’m sure I’d like the dishes. Everything looks amazing! The food is so affordable. I can’t wait to visit and try some these restaurants. Now, these all sound like some amazing restaurants to go and try out! What a range of items it seems like they have ready for people to try. These all sound so good! I would love to try any one of these places! They are making me hungry! Thanks for posting this list! If I ever go to Northern Thailand, I will know where to eat! Those all look like some amazing restaurants. I love thai food. It’s one of my favorites! They have such amazing dishes. Thanks for the tips on where to find great Thai restaurants! My hubby and I love Thai food and are always in search of authentic restaurants to try when traveling abroad. This will come in handy. I’m glad that you added street food to your list! You are most welcome, Nancy. Are you planning on a Chiang Mai trip soon? I’ve been to Chiang Mai! It’s one of my favorite cities, lots of great food. Can’t wait to go back. Are you going back soon, Rika? Definitively keep this handy food guide with you for an amazing exploration into the local food scene. Cheers. I don’t travel much, but there is a member of my extended family who does. I’ll pass this on to her. I know she’ll appreciate it! I have just started eating Thai food. I would not mind trying more authentic restaurants out. I love this post. I would try every single one of these over and over again! Lol…and that would be a great idea. Thanks for stopping by. Oh my some of those dishes look so good. I’ve never been to that part of the world but what beautiful restaurants to visit. Thanks, Tammy. Glad you liked the article. Are there any particular dishes that stand out for you? We were amazed at how different Northern Thai food was than Southern. I think my favorite might have been the Cosmic Cat Cafe, but more for the kittens ;). By the time we reached Chiang Mai we were just recovering from the water in Railay. It sounds like we need to go back and eat our way around town. A special trip to Chiang Mai is required just for the food 🙂 Indeed, northern food specialties are different and worth exploring. Thanks for stopping by. 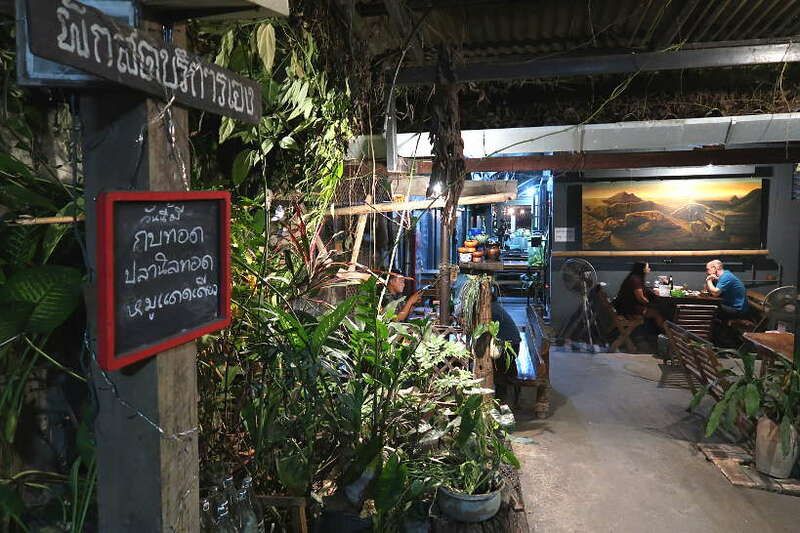 This is a great guide to Chiang Mai’s restaurant scene. I love the decor at Huen Phen, and the food looks incredibly delicious as well, especially the laarb. Love those lettuce wrapped foods, so easy to eat! What strikes me most about all the restaurants are the modest prices – so much food for so little. It’s amazing. You are right Claudia, many local restaurants offer amazing delicacies at very reasonable prices. We hope this guide invites travelers to Chiang Mai to eat local and explore the local specialties. Thanks for stopping by. We missed Chiang Mai on our last visit. Looks like we missed some good food. Great to start in a place like Huen Muan Jai for a broad introduction to northern Thai cuisine. It looks like Tong Tem Toh would be worth the lineups. So great that a food tour introduced you to a place like Laab Kai Mueang Pan Waen that you might not have otherwise found. This meat eater would head to Toy Roszab for a bbq feast. We won’t miss Chiang Mai on a return trip to Thailand. No worries, Linda. Keep this food guide handy for your next trip to Chiang Mai. All the places you mentioned are good bets!! Thanks for stopping by. Don’t blame you on the frog curry 🙂 It was not as bad as it sounds, though there are other more interesting local options available. The fried papaya salad was a first and a delicious take on the regular papaya salad. Cheers. Laab Kai Mueang Pan Waen sounds yummy. I like that the locals go to the place and it isn’t as touristy. Having a food guide to steer you to the restaurant all the locals frequent is handy. So glad you like this local food guide, Chris. The idea is to go local and explore the local flavors 🙂 Thanks for stopping by. Chiang Mai is a great foodie destination and this is a great food guide to Chiang Mai! I keep fond memories of a restaurant called Coconut Shell in Chiang Mai. I have had some great and inexpensive food there. Thank you so much. Didn’t come across Coconut Shell in Chiang Mai, what was your favorite dish from there?